I’ve written a couple times about Greg Gage and his Backyard Brains, first, in a March 28, 2012 posting (scroll down about 40% of the way for the mention of the first [?] ‘SpikerBox’) and, most recently, in a June 26, 2013 posting (scroll down about 25% of the way for the mention of a RoboRoach Kickstater project from Backyard Brains) which also featured the launch of a new educational product and a TED [technology education design] talk. The first consumer device to investigate how plants create behaviors through electrophysiology and to enable interspecies plant to plant communication. ANN ARBOR, MI, OCTOBER 10, 2017–Today Backyard Brains launched the Plant SpikerBox, the first ever science kit designed to reveal the wonderful nature behind plant behavior through electrophysiology experiments done at home or in the classroom. The new SpikerBox launched alongside three new experiments, enabling users to explore Venus Flytrap and Sensitive Mimosa signals and to perform a jaw-dropping Interspecies Plant-Plant-Communicator experiment. The Plant SpikerBox and all three experiments are featured in a live talk from TED2017 given by Backyard Brains CEO and cofounder Dr. Greg Gage which was released today on ​​https://ted.com. Backyard Brains received viral attention for their previous videos, TED talks, and for their mission to create hands-on neuroscience experiments for everyone. The company (run by professional neuroscientists) produces consumer-friendly versions of expensive graduate lab equipment used at top research universities around the world. The new plant experiments and device facilitate the growing movement of DIY [do it yourself] scientists, made up of passionate amateurs, students, parents, and teachers. Like previous inventions, the Plant SpikerBox is extremely easy to use, making it accessible for students as young as middle school. The device works by recording the electrical activity responsible for different plant behaviors. For example, the Venus Flytrap uses an electrical signal to determine if prey has landed in its trap; the SpikerBox reveals these invisible messages and allows you to visualize them on your mobile device. For the first time ever, you can peer into the fascinating world of plant signaling and plant behaviors. The new SpikerBox features an “Interspecies Plant-Plant-Communicator” which demonstrates the ubiquitous nature of electrical signaling seen in humans, insects, and plants. With this device, one can capture the electrical message (called an action potential) from one plant’s behavior, and send it to a different plant to activate another behavior. The Plant SpikerBox is a trailblazer, bringing plant electrophysiology to the public for the first time ever. It is designed to work with the Backyard Brains SpikeRecorder software which is available to download for free on their website or in mobile app stores. The three plant experiments are just a few of the dozens of free experiments available on the Backyard Brains website. The Plant SpikerBox is available now for $149.99. You can find an embedded video of Greg Gage’s TED talk and Plant SpikerBox launch along with links to experiments you could run with it on Backyard Brains’ Plant SpikerBox product page. The Venus Flytrap comes from the swamps of North Carolina, USA, and lives in very nutrient-poor, water-logged soil. It photosynthesizes like other plants, but it can’t always rely on the sunlight for food. 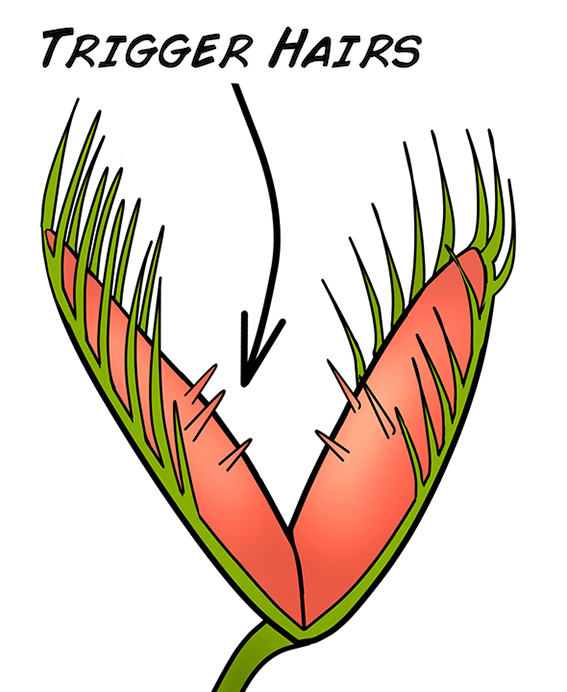 To supplement its food supply it traps and eats insects, extracting from them the nitrogen and phosphorous needed to form plant food (amino acids, nucleic acids, and other molecules). If you look closely at the Venus Flytrap, you will notice it has very tiny “Trigger Hairs” inside its trap leaves. If a wayward, unsuspecting insect touches a trigger hair, an Action Potential occurs in the leaves. 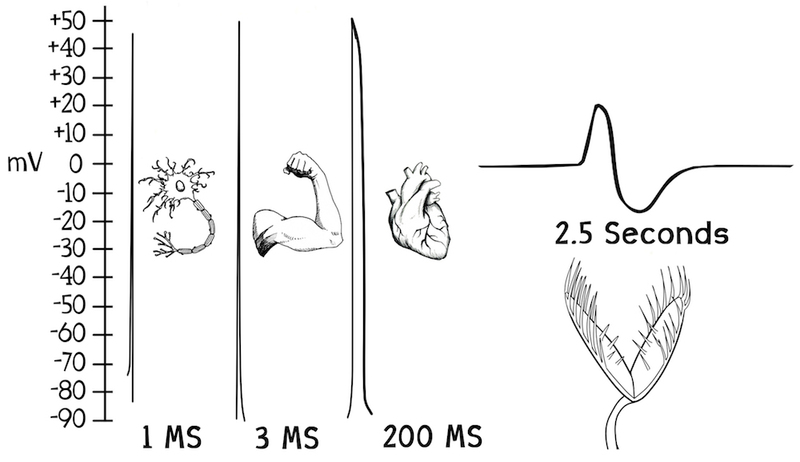 This is a different Action Potential than what we are used to seeing in neurons, as it’s based on the movement of calcium, potassium, and chloride ions (vs. movement of potassium and sodium as in the Action Potentials of neurons and muscles), and it is muuuuuuuuucccchhhhhh longer than anything we’ve seen before. 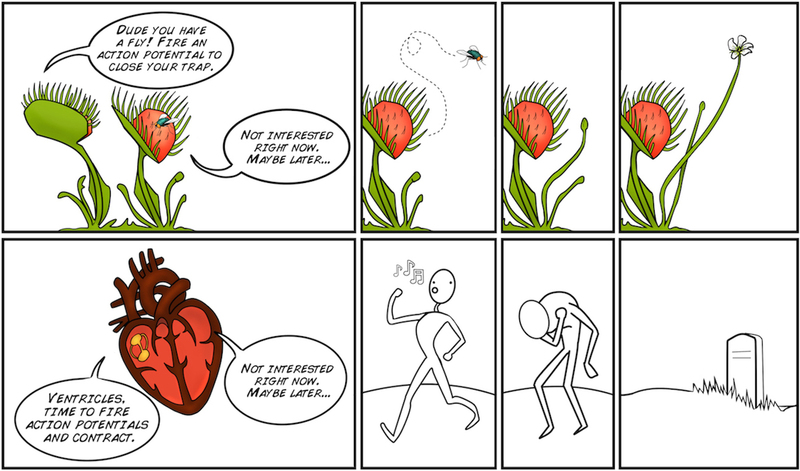 I did feel a bit sorry for the Venus Flytrap in Greg Gage’s TED talk which was fooled into closing its trap. 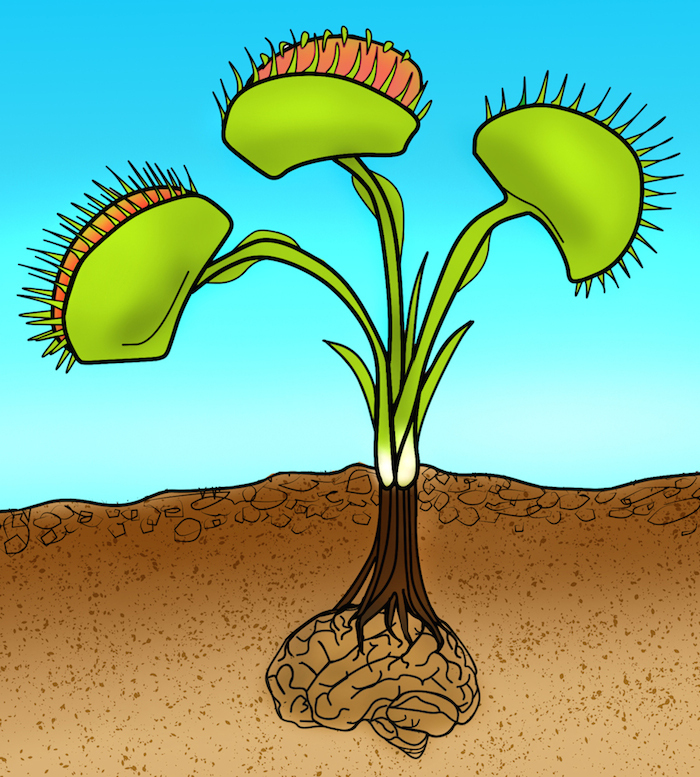 According to Gage, the Venus Flytrap has limited number of times it can close its trap and after the last time, it dies. On the other hand, I eat meat and use leather goods so there is not pedestal for me to perch on. From exploring outer space with Brittany Spears to exploring plant communication and neuroscience in your back yard, science can be found in many different places. This entry was posted in sscience education and tagged action potential, Backyard Brains, Backyard Brains SpikeRecorder software, DIY [do it yourself] scientists, electrical language, electrical message, electrophysiology, Greg Gage, interspecies plant-to-plant communication, neuroscience, plant behavior, plant signaling, Plant SpikerBox, Plant-Plant-Communicator experiment, plants, science kit, Sensitive Mimosa, SpikerBox, SpikeRecorder, Tim Marzullo, Venus flytrap on October 10, 2017 by Maryse de la Giroday. There’s a bit more about Kloss and her camps, although it’s mostly about Kloss’s career, in a June 2017 article by Laura Brown for In Style magazine. The problem, she [Kloss] believes, is access. Many middle and high schools don’t offer coding courses, although this is slowly changing. And when they are offered, they tend to be oversubscribed by male students, creating an uncomfortable imbalance in the classroom. Then there are the popular coding bootcamps, such as the one that Kloss took, but they often come with hefty price tags: Tuition can cost upward of $1,000 a week. There have also been questions about how sustainable the coding bootcamp business model really is, since several companies, like The Iron Yard and Dev Bootcamp, have had to shut down recently. I guess we’ll see what happens with the Canadian $50M in the next few years and whether it proves a more effective approach (i.e., government and not-for-profit) than the individual business and not-for-profit efforts seen in the US. This entry was posted in science funding, science policy, sscience education and tagged CanCode, coding bootcamps, computer coding camp, Dev Bootcamp, Elizabeth Segran, Google memo about women, Innovation Science and Economic Development Canada, James Damore, Karlie Kloss, Kirsty Duncan, Kode With Klossy, Ladies learning Code, Laura Brown, Ministry of Science, Navdeep Bains, New York Flatiron School, Ruby on Rails, supermodel, TechCrunch Disrupt Hackathon, The Iron Yard on October 4, 2017 by Maryse de la Giroday.